Tonight is Christmas Eve! How are you going to spend your evening? I went back to France for the holidays this year, so tonight I will be eating the French traditional Christmas cake called “Bûche de Noël”. 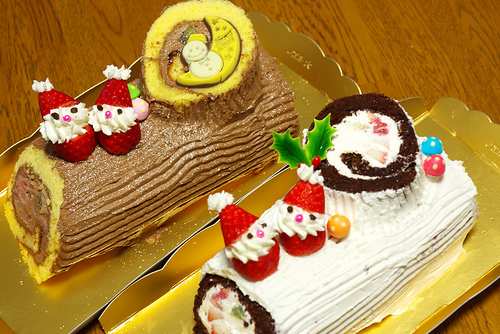 It’s shaped like a log and uses either chocolate or chestnut cream traditionally, even if recently you can find strawberry or white chocolate “bûches” as well. In ancient times when there was no electricity, people needed to find a way to have light and warmth during the long Christmas Eve until Christmas day on the 25th. Therefore, people needed to find a big enough log to put in the fireplace that could last for many hours; and nowadays this tradition remains in the shape of the traditional Christmas cake. As the season was right, I decided to bake a bûche de noel with chestnut cream and sugar-coated chestnuts together with the participants in this month’s cooking class in Oyamazaki. Christmas cakes seem to be popular because we had 20 people join this time. We first started by cooking the bûche because it needs to cool down as much as possible before eating it. Usually you should leave it in the fridge all night and eat it the next day but we only cooled it down for a few hours. 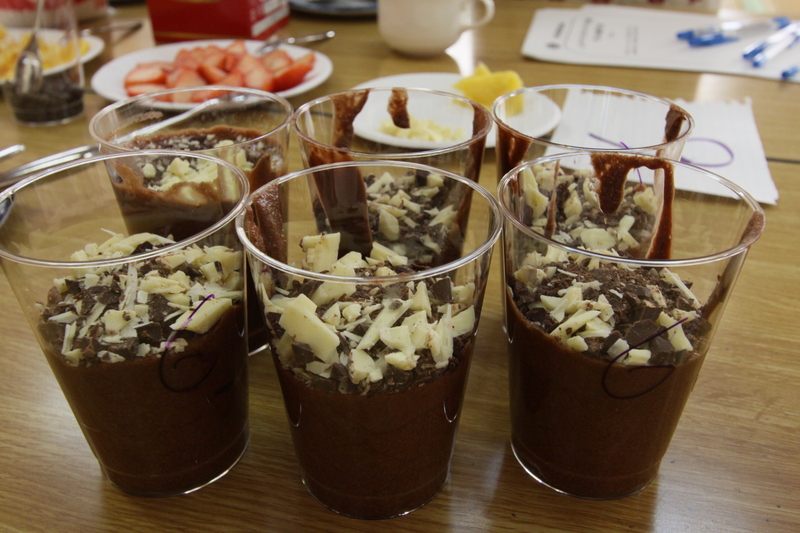 Participants were really eager to make a beautiful cake so they successfully completed the different steps and put the cake to cool down. In the meantime, I held a small presentation about Christmas habits in France and in Europe. 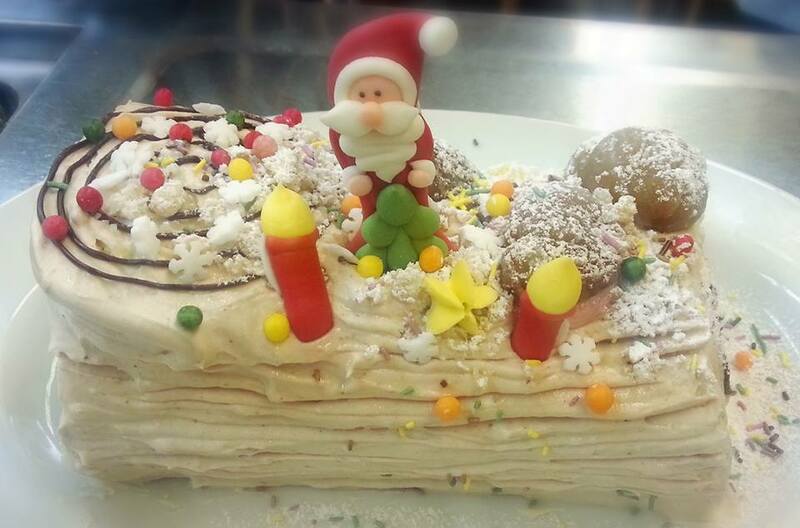 In France, Christmas Eve’s meal always ends with the bûche. 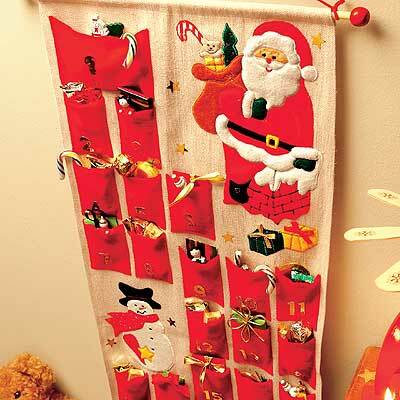 Everyone usually also has an advent calendar in their homes to enjoy chocolate or sweets every day until Cristmas. Recently, other brands have started making their own calendars, so you can find advent calendars with makeup, toys, tea or alcohol for example. Other European countries also have very interesting habits, such as Finland where people usually drop by the cemetery on Christmas Eve to light their dead ones’ tombs with candles, or Bulgaria where women use the occasion to give bread to the man they like. In the North of Europe, it’s often San Nicolas and not Santa who brings presents on December 6th, whereas it’s a witch called La Befana who makes children happy in January in the South of Italy for example. We were then pretty hungry so we cooked the lunch menu, a meunière fish (cooked in butter) and some mashed potatoes. It was then time to decorate the bûches. I had brought some cake decorations in sugar from France which were really popular among the participants. Everybody was so dedicated to decorate their cakes that time flew by and it was time to eat our artworks before ending the day. 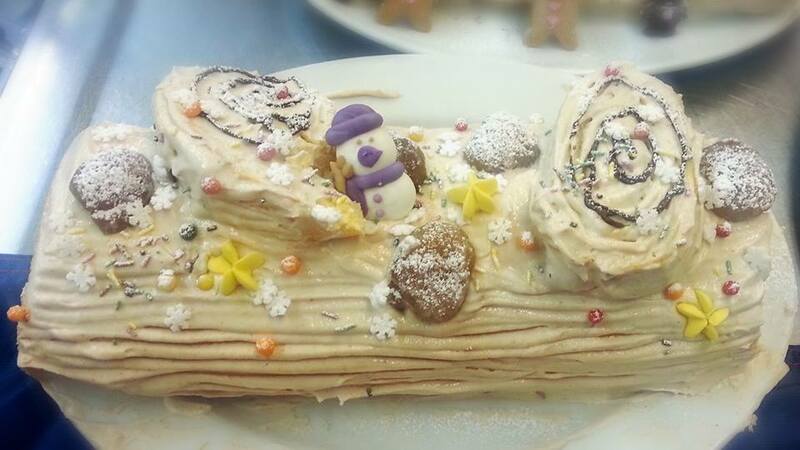 It was my first time to try and bake my own Bûche de Noël but it was a lot of fun to do it with everyone and see what kind of cake they would come up with in the end. See you next year for more fun French cuisine! 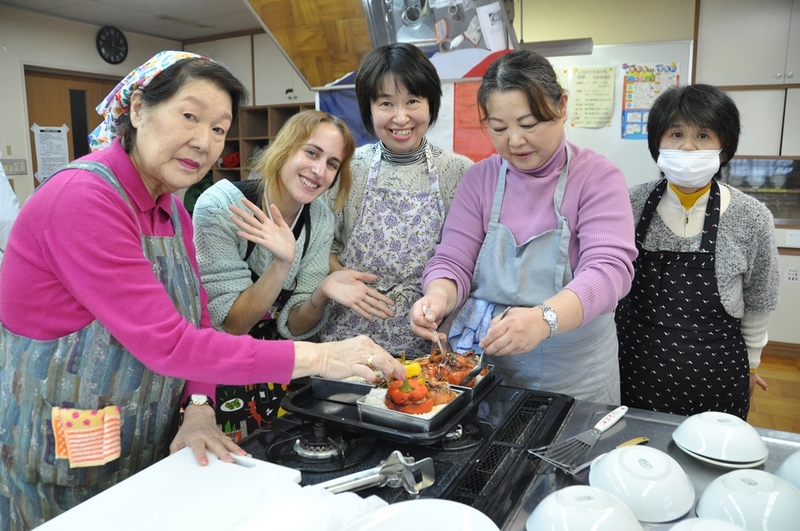 On December 18th, I did a French cooking class and seminar in Oyamazaki Town. Given it was my 3rd time going there I knew some of the participants and the atmosphere was really relaxed. We first started with the cooking. This time I chose to do some “petits farçis niçois” or meat stuffed vegetables. It’s a typical meal in the south of France, especially around Nice or in the Provence area. It’s also really healthy given that you have meat, vegetables and rice all in the same dish. We used tomatoes, zucchinis and red and yellow peppers that we stuffed with meat seasoned with garlic and Provence herbs. At the bottom of the dish you put some rice so it cooks together with the vegetables in the oven and develops a particular flavor as it absorbs the juices released by the vegetables when they cook. While the food was cooking I did a short presentation about the Gironde area, the department where Bordeaux, my hometown, is located. I started by presenting the different sceneries. Indeed, Gironde’s Atlantic coastline is more than 100km long and boasts many beautiful beaches that are famous for surfing. We even have a world surfing competition that takes place every summer. The Gironde area is also famous for its wine, but also for its numerous medieval villages and historical ruins: while sipping wine in the various wineries along the way, you can visit many churches, abbeys and fortified towns as well to polish your knowledge of history. Many events also take place throughout the year in the Gironde region too. Some events will take you back to the medieval ages (the Saint Macaire festival), others to the 20th century (Soulac 1900), others focus on culture with concerts, poetry, theater, dance or circus performances (Les scenes d’ete en Gironde), one gives you the opportunity to run among the vineyards in strange costumes (The Medoc Marathon) etc. Everybody can find something to enjoy! The Gironde area also boasts many delicious treats. It is the homeland of duck cuisine (magret, confit and foie gras), caneles and almond macarons (you will never find those in Paris!). 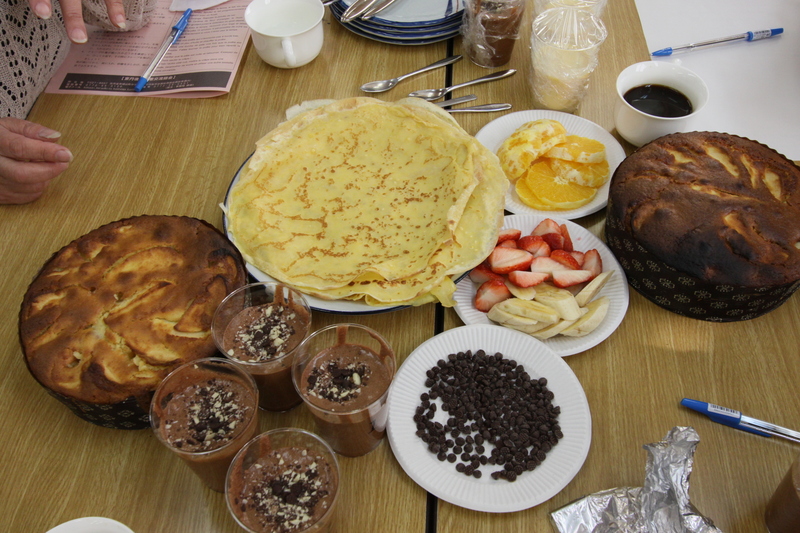 The food was then cooked so it was time to fry some French toast for dessert and enjoy our hard work! Everybody loved it, especially the lovely presentation of the vegetables – perfect when receiving friends for lunch or dinner at home. Looking forward to meet everyone again next year! Summer has finally arrived and with it the Gion Festival. Did you enjoy it? 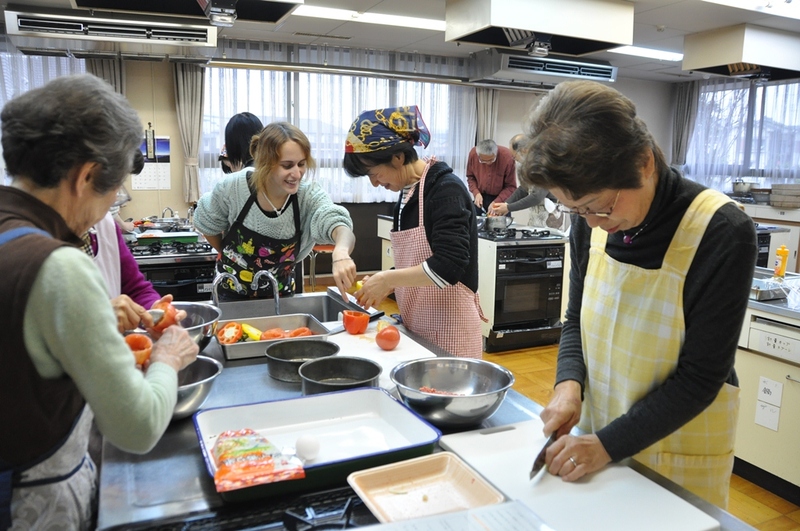 Last month, I organized a bento lunch cooking class for international residents and it was a lot of fun, even if the preparation was quite hard! In France, we don’t have bento lunch boxes. Instead, when we go on school excursions or have to take our lunch to work, we often prepare a sandwich in the morning, or put some salad, pizza or quiche into a Tupperware. I am always amazed by how cute and diverse my coworkers’ lunch boxes are. It’s quite a challenge for me to make a bento, and I don’t think I am alone in this. 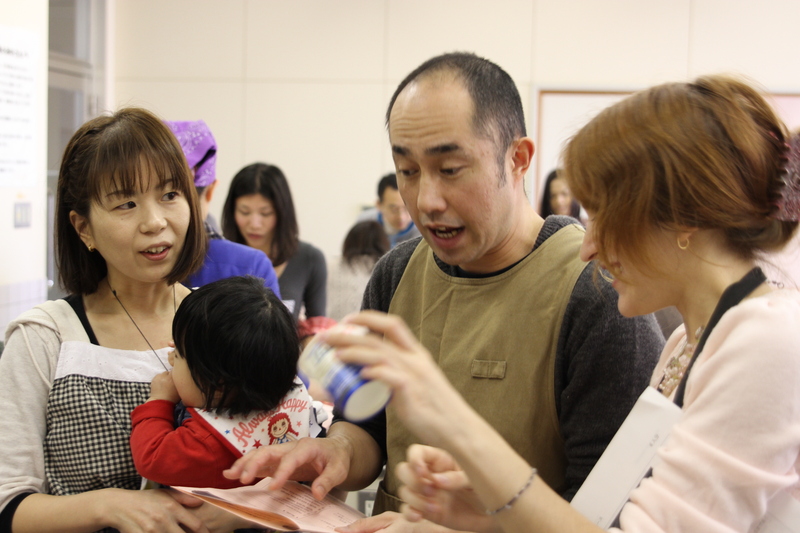 Many foreigners in Japan and people outside of Japan are amazed by the Japanese “bento culture”, and a lot of bento recipe books have started selling in France and abroad. 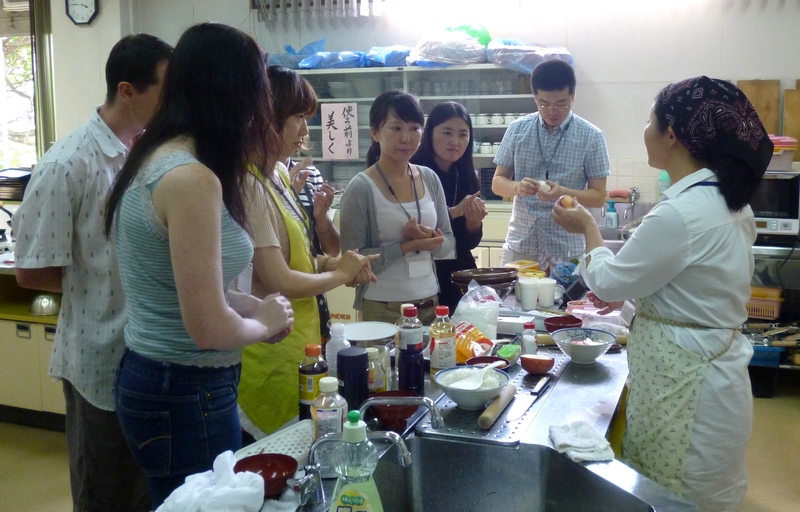 That is why I decided to make a bento cooking class for foreigners living here, with really simple recipes to learn how to make the basics and use Japanese ingredients such as dashi for example. 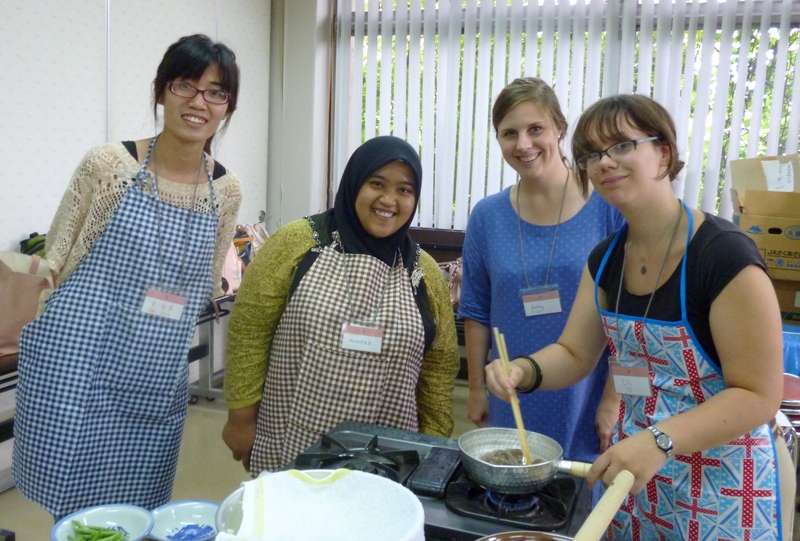 Together with a Japanese teacher, we held this class on June 29th in Uji City. 19 people showed up for the event, from many diverse cultural horizons such as China, Hong Kong, Korea, Indonesia, Malaysia, America, Australia, New Zealand etc. 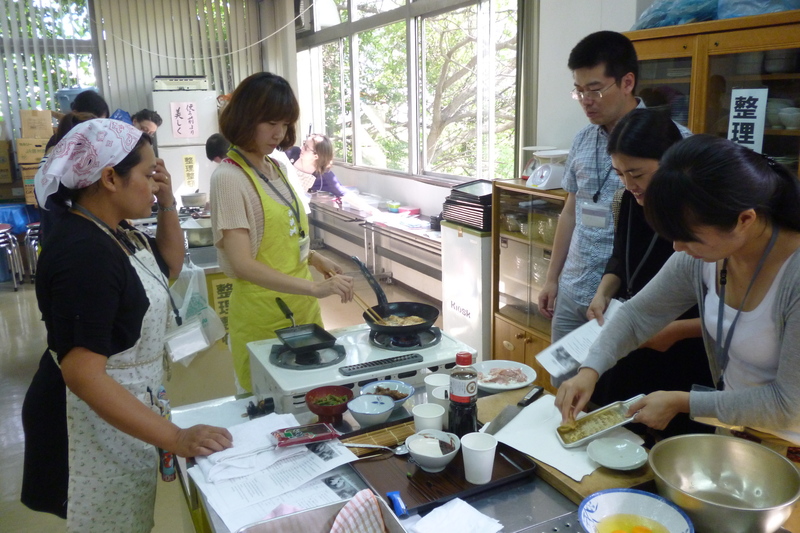 We had the recipes ready in 3 languages, Japanese, English and Chinese. 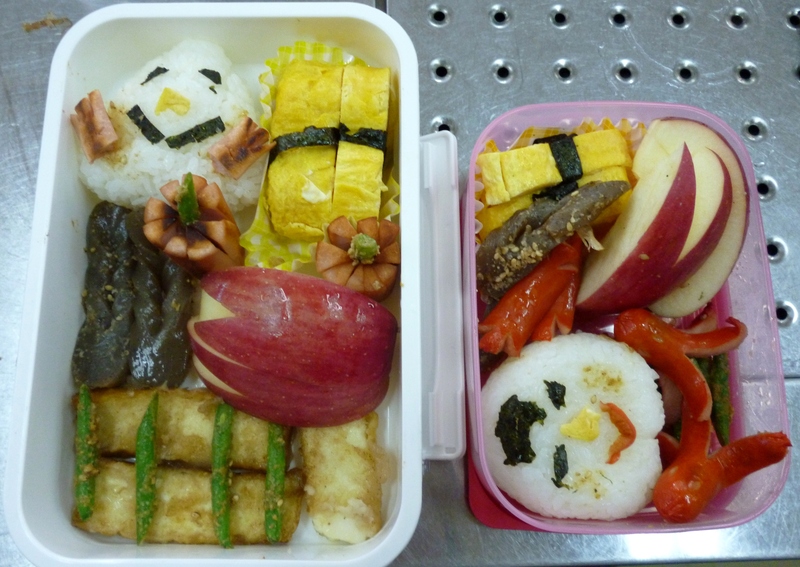 People then did their best to recreate the recipes and make a cute bento by themselves. 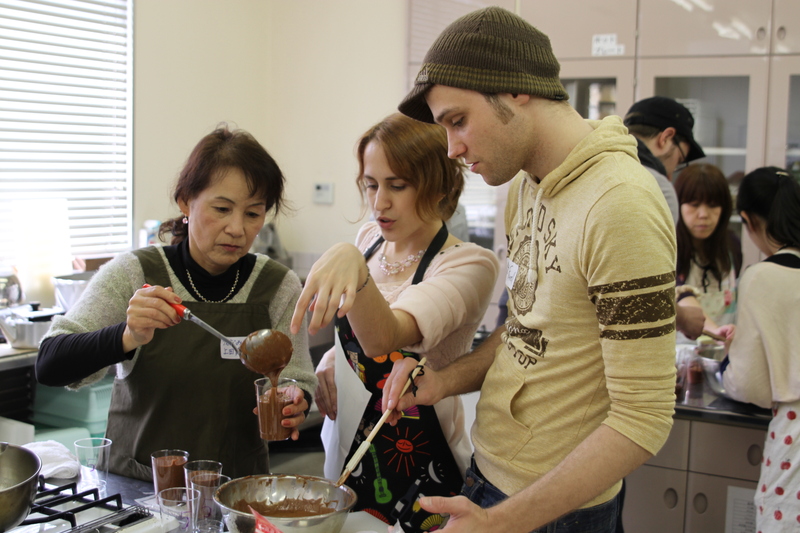 I practiced only once with the teacher before the class, so I learned again together with the participants. It was really hard to roll the omelet with chopsticks without breaking it or correctly peel the apple’s skin so the “ears” of the rabbit turn pretty, but in the end everybody succeeded and had a nice bento to enjoy. 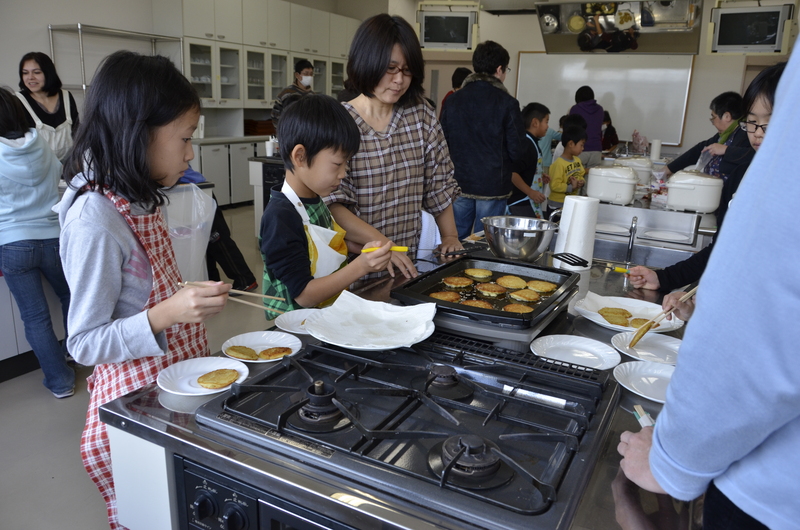 Some participants even tried to make “kyara-ben” or character bento by drawing cute faces on their onigiri. We then all ate our bento together. 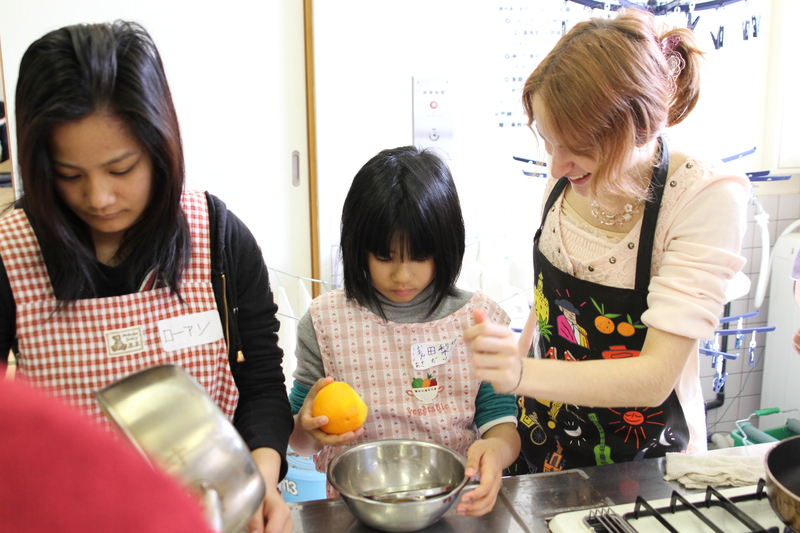 People got to know each other really quickly (cooking makes bonds!) and soon the room was full of laughter as they compared their bento and engaged in friendly conversations. 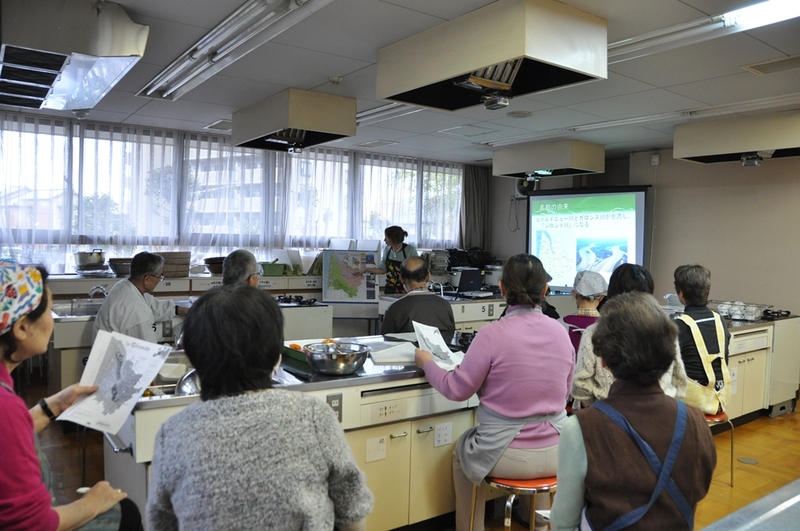 I hope what they learned during the class will be useful and that next time they pass that dashi or konyaku in the supermarket, it will give them ideas to try new recipes and master new bentos. I will definitely give it a try! Hi! This is Alice, the CIR at Kyoto Prefectural International Center. 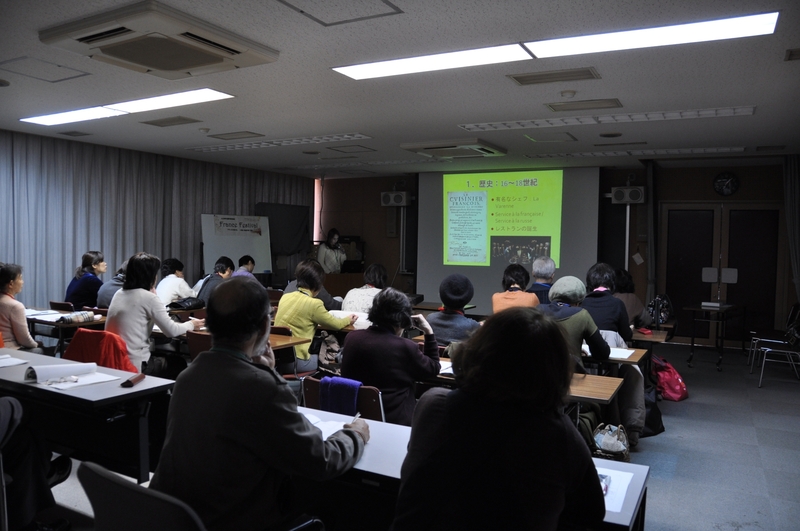 At the end of January, I was lucky to participate in 2 very different events in Kyoto Prefecture. 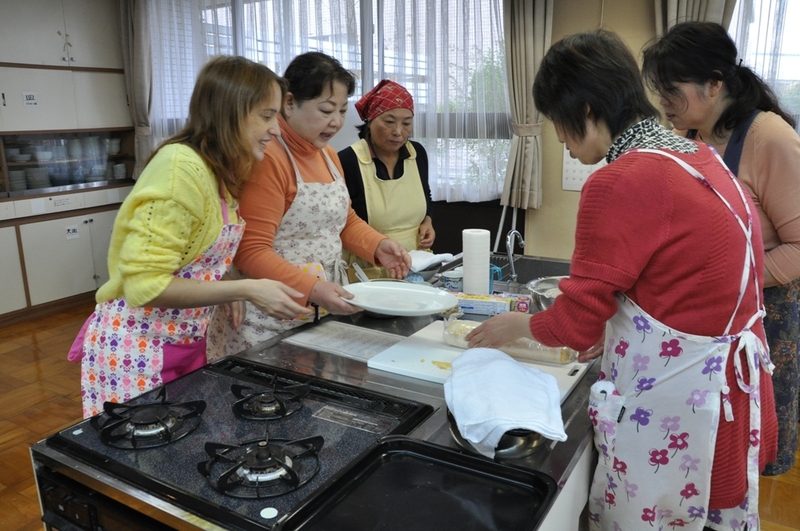 The first event on January 23rd was a French cooking class organized in Oyamazaki Town, a 15min train ride from Kyoto. I already went there last year to cook some “Boeuf Bourguignon”, a beef stew braised in red wine, and “Riz au Lait”, a dessert made from rice, milk and sugar. 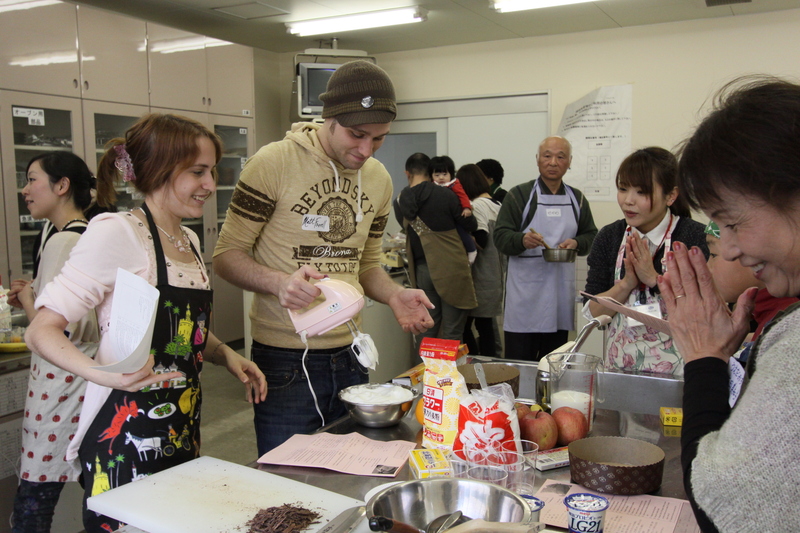 Cooking French food in Japan is very challenging, because the taste of the ingredients is really different (everything is sweeter in Japan! 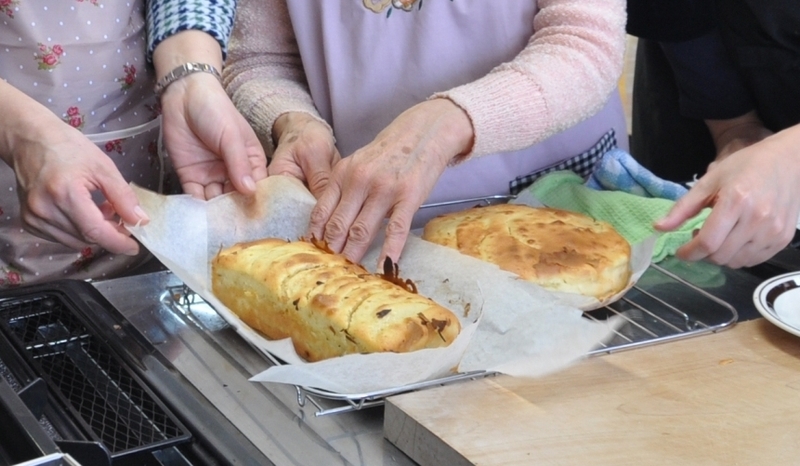 ), some ingredients do not exist (such as what we call “crème fraiche”, or fresh cream), and most of the dishes require an oven, which is really rare to find in Japanese homes. 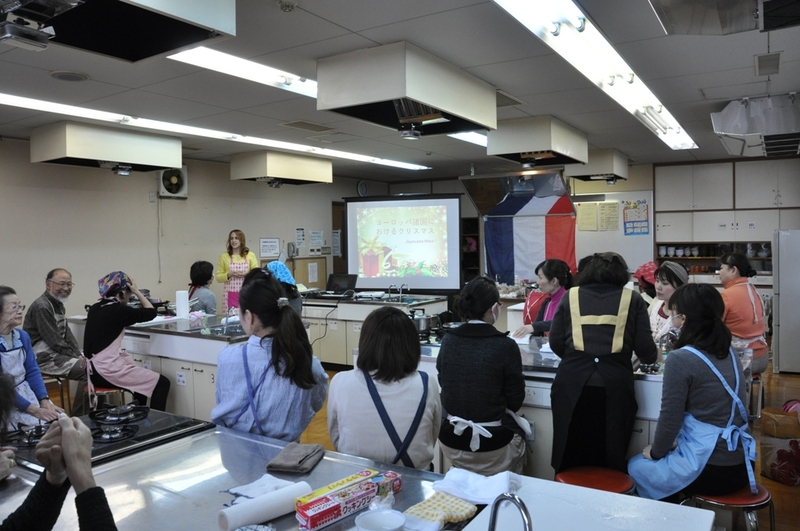 I first started with a presentation about French cuisine and eating habits, explaining how they changed through history, and how it was listed as an “Intangible Cultural Heritage” in 2011. What was classified is more French people attitudes and relationships to food rather than a dish in particular or the famous “French gastronomy”. Indeed, in spite of today’s stressful and busy life, most of the French still take a 2hour-lunch break, and still maintain 3 steps in their meal: starter, main dish and dessert. Dessert can be either cheese, yoghurt, fruit or a pastry. It feels strange to me if I do not eat something after finishing my main dish! 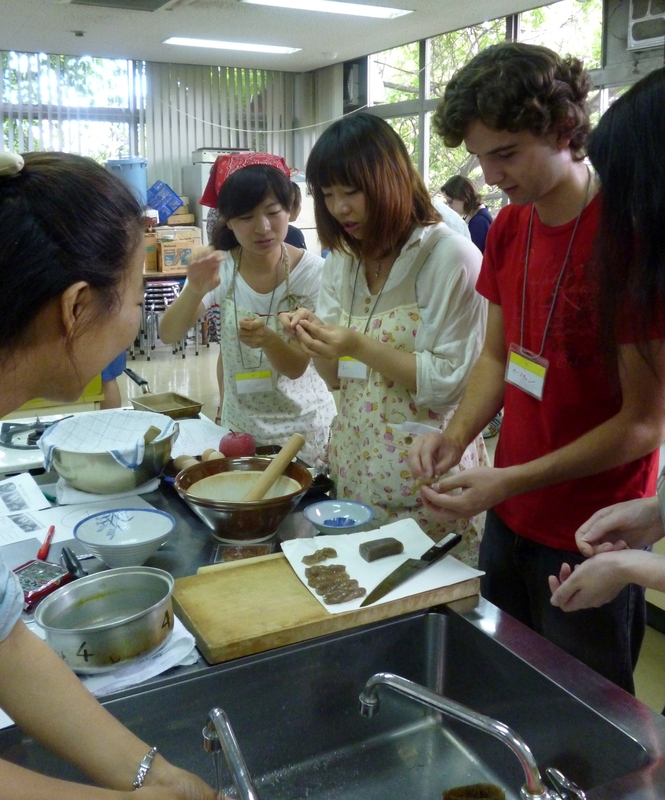 It was then time for the participants to try their hand at French cuisine. 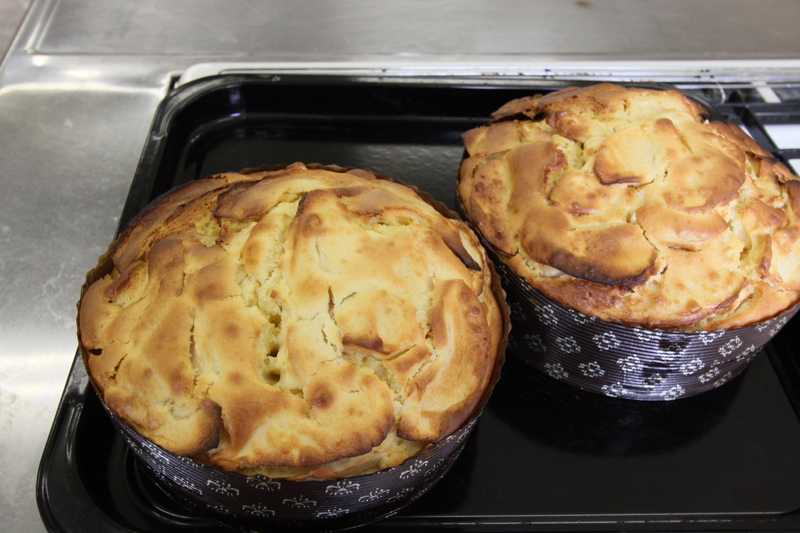 I had chosen a very simple cake recipe, the famous “gateau au yaourt (yoghurt cake)” that even 5 year old children can make. Basically, you just have to use one yoghurt, and then reuse the package to measure the other ingredients. No need of scales or particular cooking experience! The easiest cake in the world! This cake being really basic, we made an apple and a chocolate version. 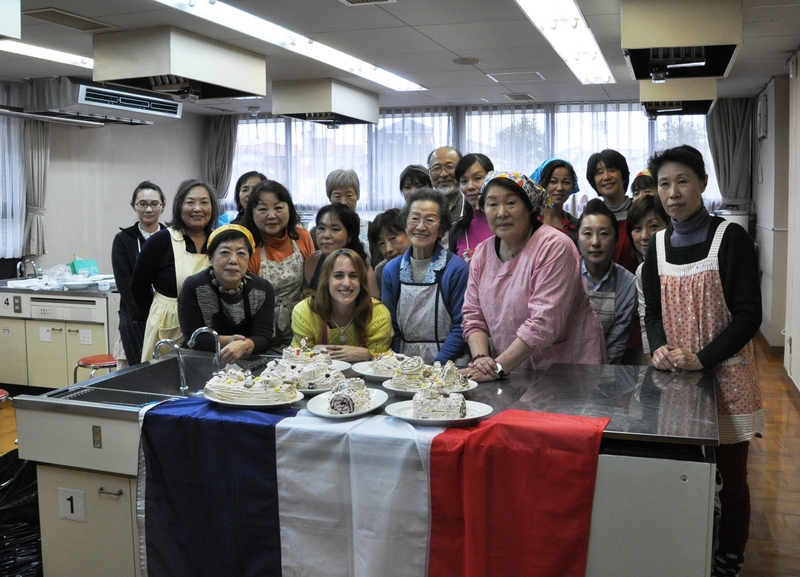 Participants were really happy to find out that French cakes can be really easy and fun to do, and I am glad I had the chance to go out and meet the very enthusiastic and sweet people of Oyamazaki. I hope we can meet again next year! 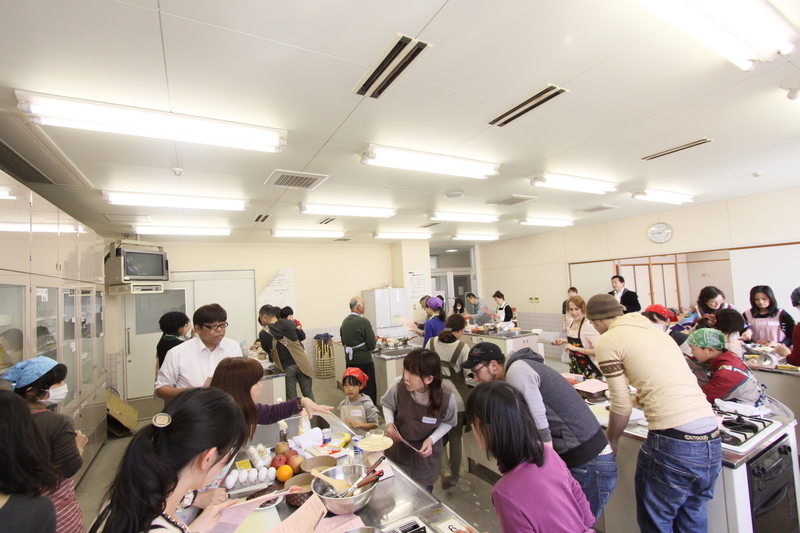 The second event was held on January 27th in Nantan City, approximately one hour from Kyoto. Held every year, it is quite a large scale event with a hundred participants and booths from many countries in the world. I had the chance to participate this year, together with people from Bhutan, the Philippines, India, England and Germany. 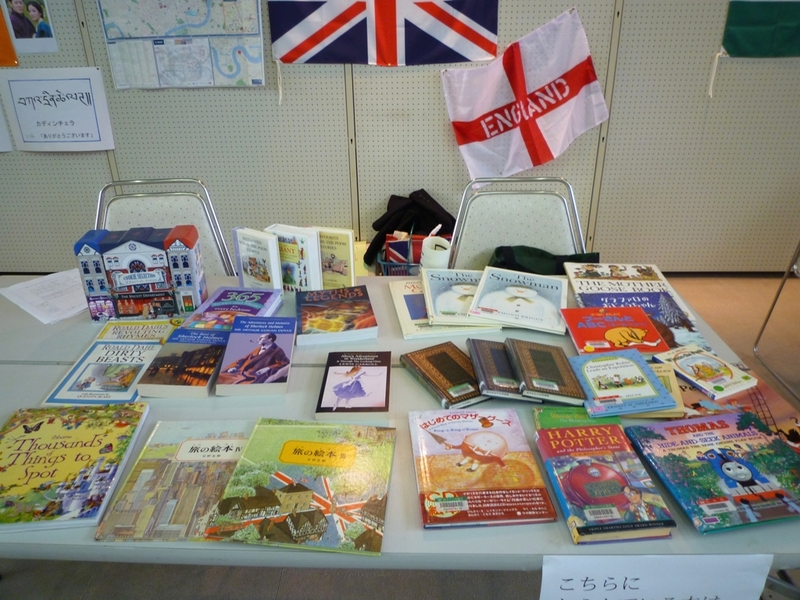 Everybody had prepared a small booth with various objects, clothes and sometimes even music instruments from their country. 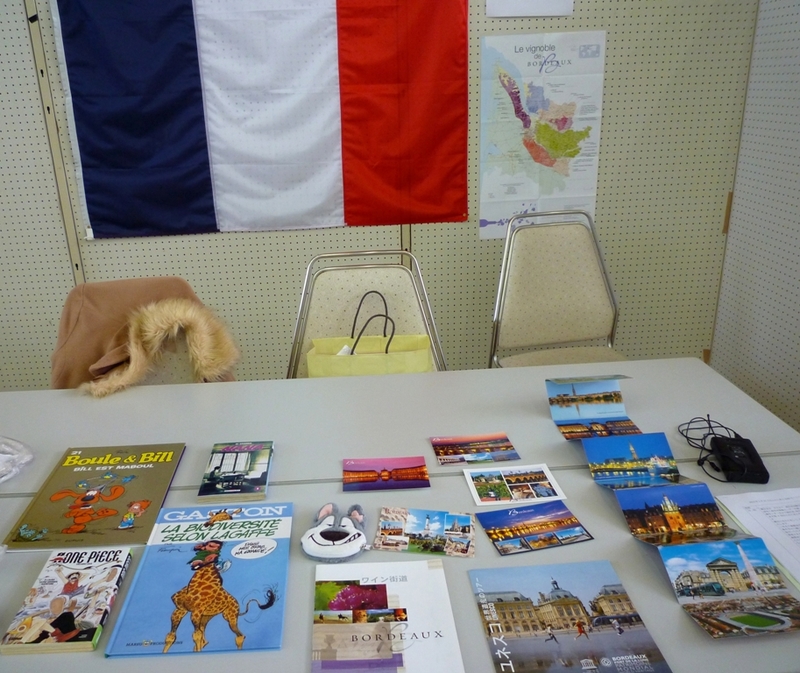 For France, I had brought some maps and postal cards of Bordeaux, my hometown, French manga　called “BD” in French, twice the size of Japanese manga and in full color, euro coins and Japanese manga… in French! Children were especially surprised to learn that we all use the same currency in Europe, but that the heads side of the coins are different from each country. 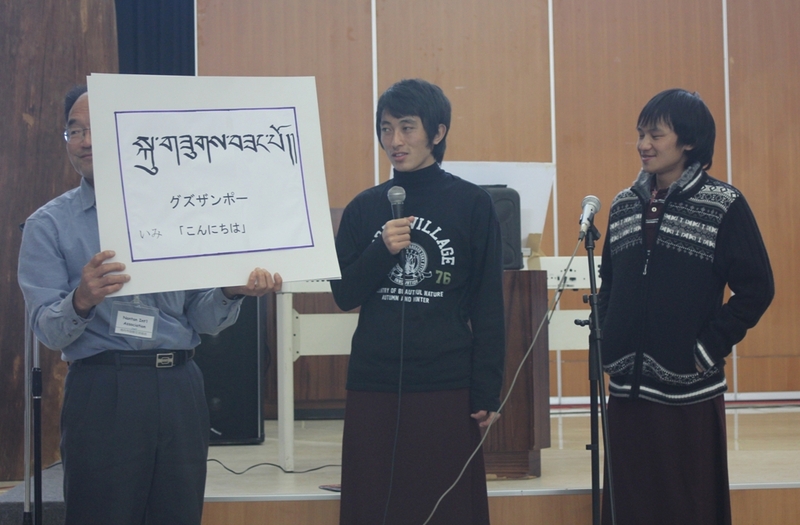 The event started with Bhutan, introducing their language, Dzongkha, and teaching children the basic greetings. We then learned how to multiply the Indian way, and I wished I had known this earlier in school to get better grades! Mathematics became so much easier. We got to move our bodies afterwards, thanks to games from the Philippines. The kids especially enjoyed playing with a ball made from a sort of paper. You have to make the ball bounce on the inside of your legs as many times as you can, but it almost turned out into a giant soccer party, which was really fun as well. Londo Bridge is falling down! Stilt race: run for the pogs! France’s turn was after that. I had prepared a stilt race with Pogs to win. The children and their parents both participated in the race and were divided into teams. Encouraged by French pop music, they rushed through the room to finish the race as quick as possible and win a lot of Pogs. Surprisingly, the children’s team won against the adult team! After the race, everybody was busy trying to win other children’s Pogs and play together. 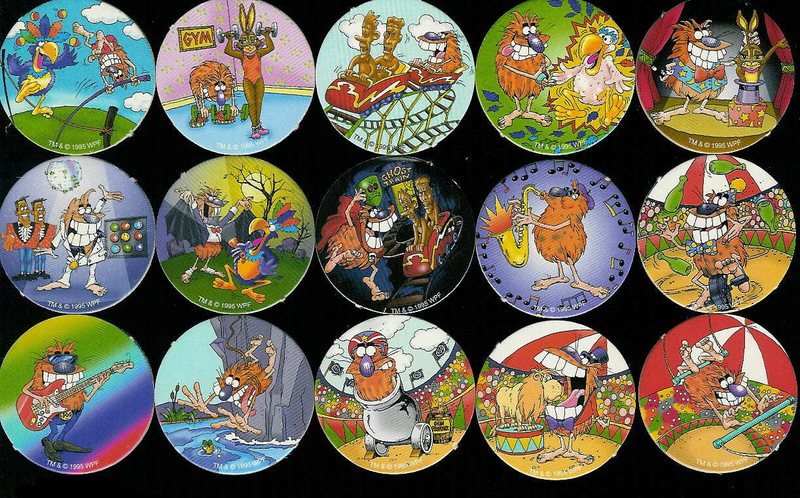 Actually, the Pog fad in France soared in the 90s before fading out again, so maybe nowadays French children don’t know about them… I had a lot of fun collecting and playing with them when I was a child, so I hope Nantan children will enjoy them too! We then sang a German popular song in many languages before it was time to go back home for the children. Despite the amount of preparation needed for such a big scale event, everything went smoothly thanks to the experience of the Nantan International Association and the volunteers who participated. I had a great day playing with the children and learning about other countries in the world! I also hope to participate again next year! Hi everyone! This is Steven, the CIR in Seika. I’d like to tell everyone about a foreign culture-related event I put on recently. Did you know that many Jewish people do not celebrate Christmas? As a Jewish person, I grew up celebrating a different holiday called Hanukkah. Hanukkah comes at a slightly different time every year because it is pegged to the Hebrew calendar, but it is always around the same time as Christmas. However, Hanukkah has its own special customs that are unrelated to Christmas. 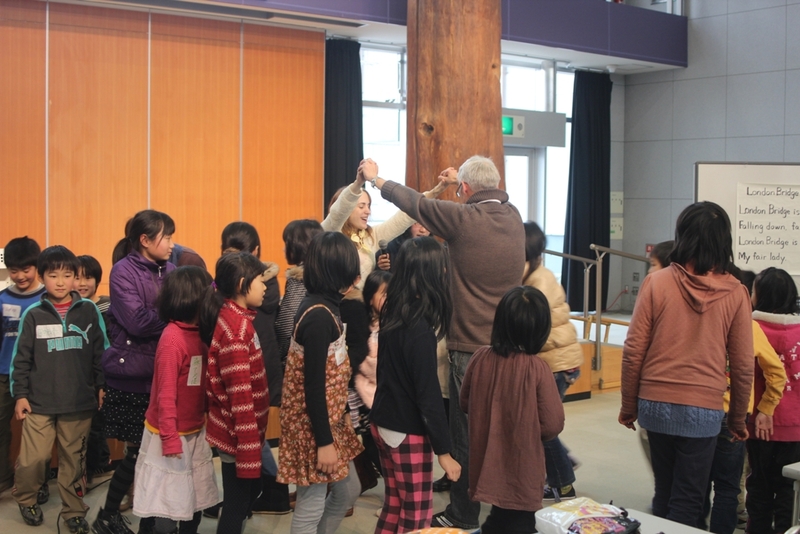 On Sunday, December 9th, I had the opportunity to teach 17 children and their parents about Hanukkah at the Mukunoki Center in Seika. First, the event opened with the story of Hanukkah. Hanukkah is a holiday which celebrates two miracles. The first was that the ancient Jews successfully rebelled against their Greek oppressors despite a vastly smaller army. The second was that when the Jews built a new temple and rededicated it, their menorah (nine-branched candelabrum) burned for a whole eight days, even though there was only enough oil for one day. 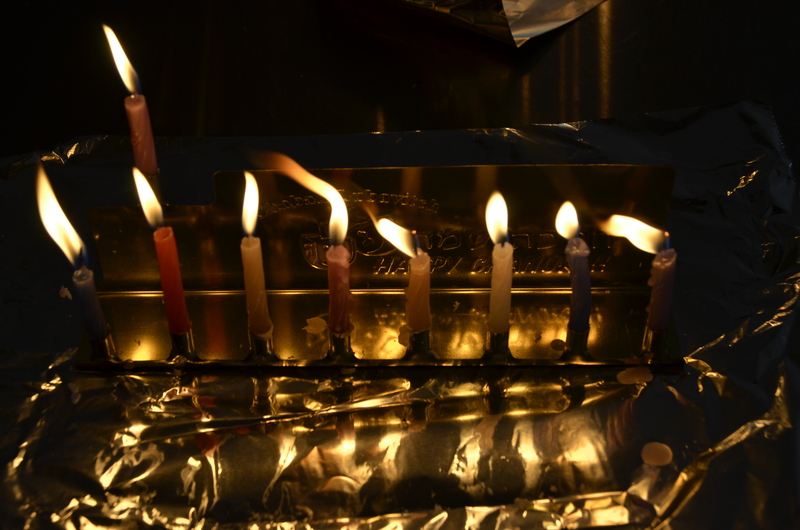 For this reason, Hanukkah is celebrated over an eight-day period. 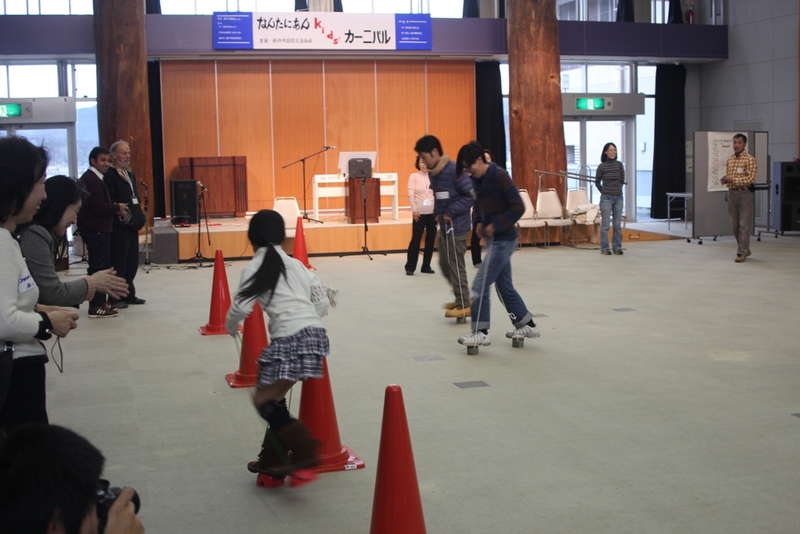 After that, we moved onto the activities section of the event. First up was cooking latkes, traditional Jewish potato pancakes which are often eaten on Hanukkah. By the end, everyone was getting good at flipping them over, and I’d say they came out pretty well! Next came the crafts. First, everyone made pop-up cards and decorated them with various Hanukkah-related images, such as menorahs. Then they all learned how to make paper dreidels, or special tops that children play with on Hanukkah. It was great getting to teach everyone about my culture and have fun in the process. Looking forward to next time!